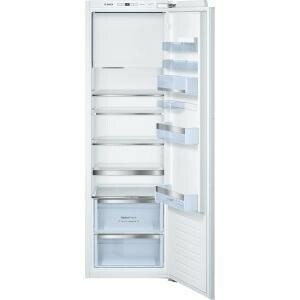 The built in, fixed hinged Bosch KIL82AF30G Fridge with freezer box has a net storage capacity of 287 litres split between the fridge and freezer box. There are 5 removable safety glass shelves, 4 of which can be adjusted and 5 trays inside the door, including a dairy compartment. The VitaFresh box keeps fruits and vegetables vitamin-rich and fresh up to twice as long - thanks to optimum humidity. If the SuperCool function is activated, food that's just been purchased is cooled more quickly. At the same time, it stops food already in the fridge from warming up. LED lights bring a completely new lighting concept to fridges, guaranteeing even, glare-free interior illumination. LED lights use less electricity than conventional fridge lights and last an (appliance) lifetime. You can reduce energy consumption, help the environment and save money as it comes with an A++ rating for energy efficiency. It also features auto defrost technology which means you don't have to spend time chipping away the ice. The 35 litre freezer section with a 4-star freezer rating features 3kg freezing capacity in 24 hours, 22 hours of safe storage time in case of power failure and an ice cube tray. The optical and acoustical door open warning signal tells you if the fridge is not closed and thanks to its reversible door, the KIL82AF30G can be easily configured to fit into most appropriately sized spaces.